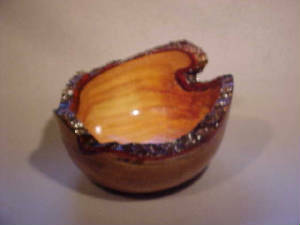 I will be displaying pictures of the items I make on this page. As I get time I will put in more pictures. 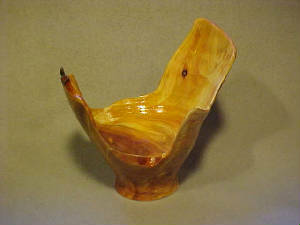 Most of these items are made from "found" wood that came down in storms, construction, etc. Sometimes I also break down and buy some exotic wood, just for fun and hopefully some profit. 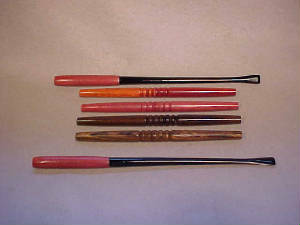 The pictures may show products that have been sold, but something comparable can usually be made. 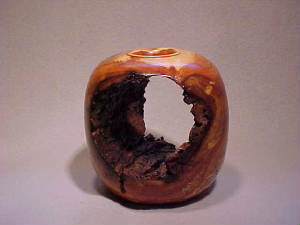 Some of the weirder, artsy items are one of kind, they owe a lot of their character to the stresses the tree experienced. 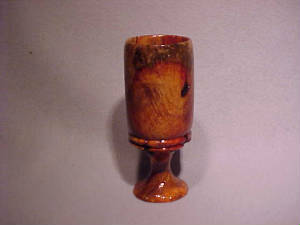 If you visit me at the Michigan Renaissance Festival you can see and touch the items you are considering. 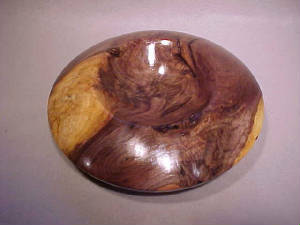 This is a smooth, dense, beautiful, African hardwood. My wife already laid a claim to it. 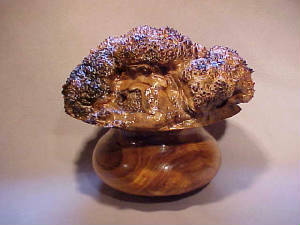 This beautiful burl comes from Africa. 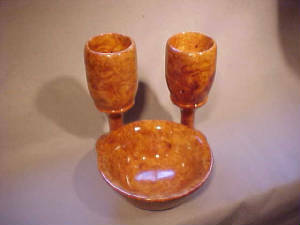 I bought a piece that became a bowl and 2 goblets. 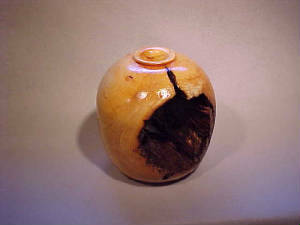 This is one of 4 turnings from a log attacked by mold. About 9" in diameter. Third in the series. Once I started on these I couldn't stop. 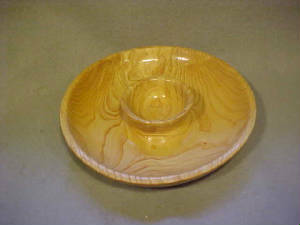 A six inch bowl with a nice symmetrical curve. 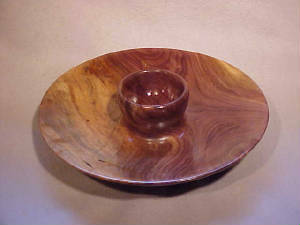 When our CEO retired I made him a walnut bowl and an executive shot glass. He sent me this picture. 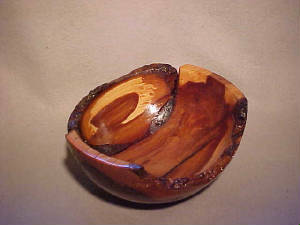 One of our managers wanted a wooden "softball" and this was the result out of mulberry. 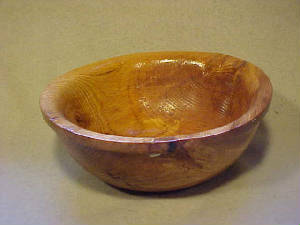 This 6 inch bowl was turned from some apple that sat in the wood pile a couple years. I was feeling artsy again. 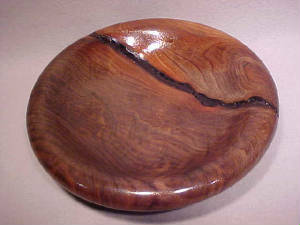 Turned from a triple crotch of cherry and looks like an exploding bomb. 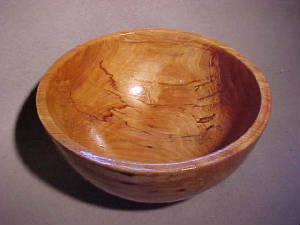 This kind of turning is purely decorative, but it feels good to look at it and say "I made that". 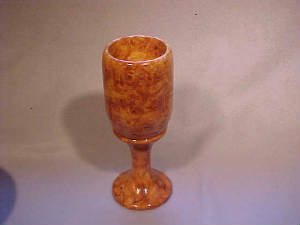 One of the goblets I made from the piece of burl. My wife likes them so they must be good. I hoped this set would stay together. The first day I displayed them a person bought them for $600. 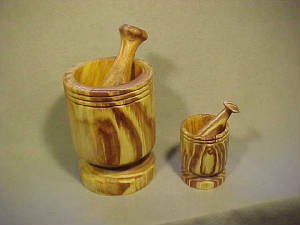 My wood supplier asked for a 10" tall mortar so here it is compared to a standard 5" tall mortar. Some more of that old maple. The guys who counted the rings said it was about 300 years old. The texture, color, and figure all appeal to me. 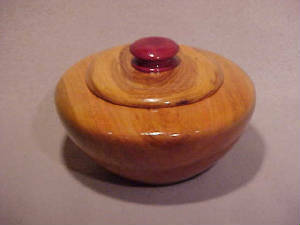 This shows off the red streaking common in Box elder. 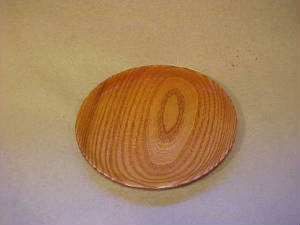 Sort of a flying saucer shape, perhaps I was channeling Fox Mulder when I did this one. 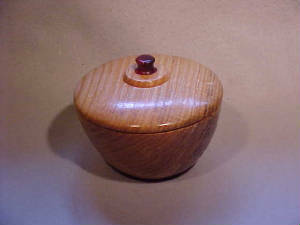 A nice bowl of oak with a fitted lid. The bark had to be stabilized with super glue, but it was worth it for the look. A different tree gives a different color and look, even if it is the same species. 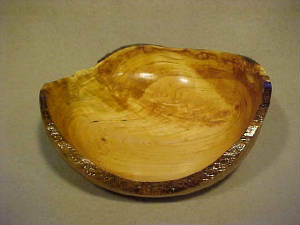 Honey Locust is a very dense wood. 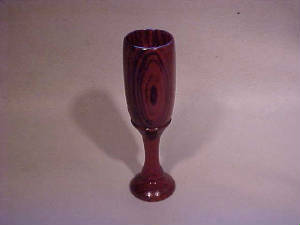 A relative of rosewood. 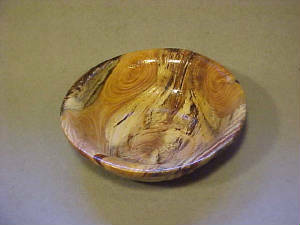 Definitely one of a kind, since this was all the wood I had. 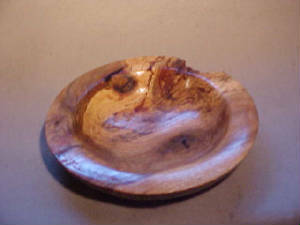 One of several bowls with "crotch" figure I got from a 15 inch log I cut in half. 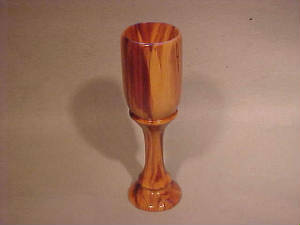 Another African wood, somewhat similar to walnut. 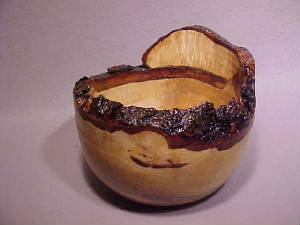 The bark is like birch but dark and the wood looks like apple. Nice stuff to work. Lighter in color than the ones above, this turning came from higher on the tree. 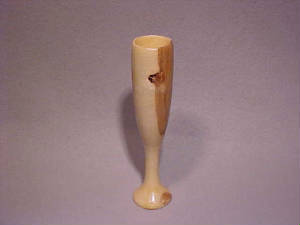 This goblet is about 8 inches tall. I like the color contrast. From every side this one looks different, form smooth to totally weird. I like it. 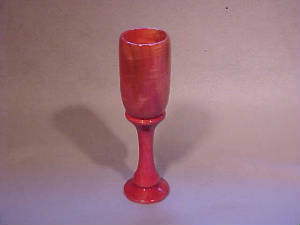 This is a one of a kind goblet. My wife grabbed it as a decorator. 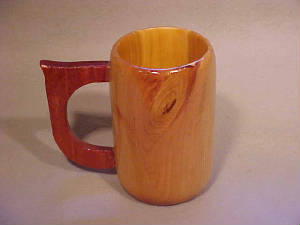 I love the color of this wood. 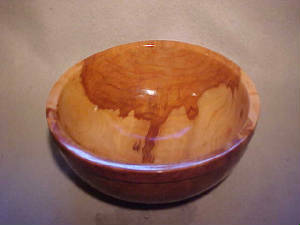 A deep bowl turned on the end grain. About 7 inches in diameter. 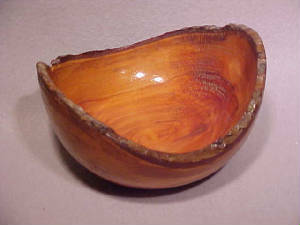 Every wood has its own unique color and look. Mulberry comes out sort of yellowish. 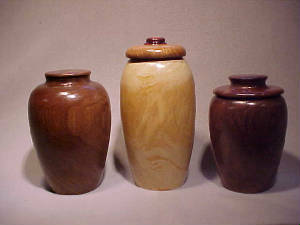 I call these urns, but you can call them covered vases, or whatever you want. 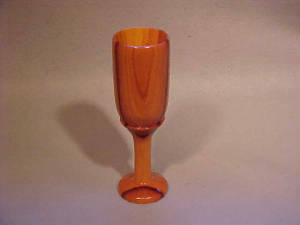 Some more new items using fancy hardwoods. You can sip and smoke in style. 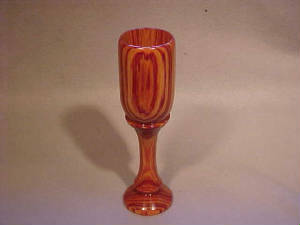 This goblet is very slender and 9" tall. Too bad most hickory becomes firewood. 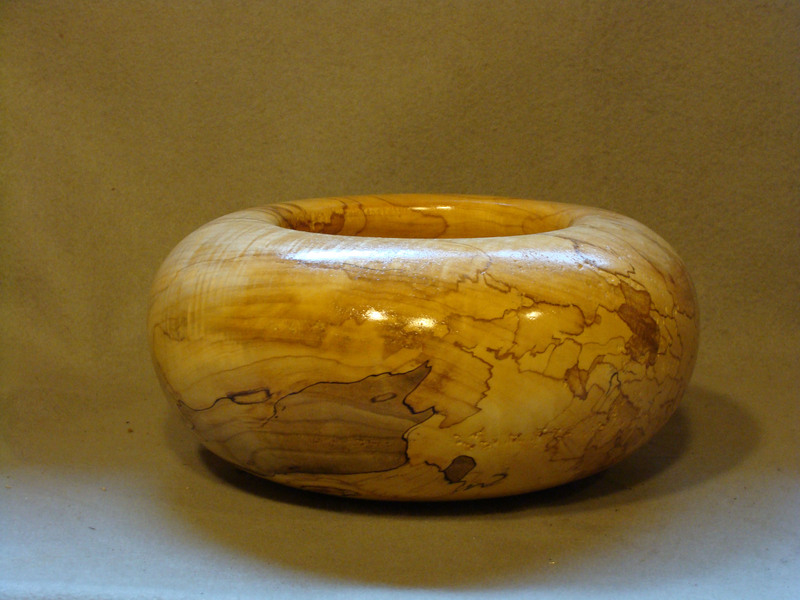 The log had a weird bulbous shape on it, so that became the top of this turning. 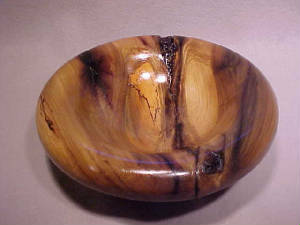 A dense African wood. 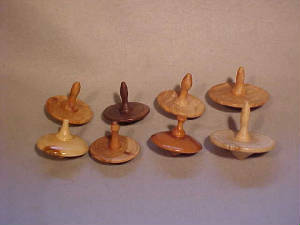 The trees are small so they don't make good lumber, but great for turning. 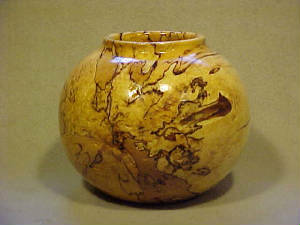 A lidded bowl about inches in diameter. 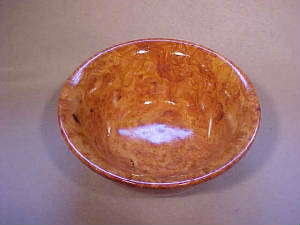 This is the natural color of this wood. 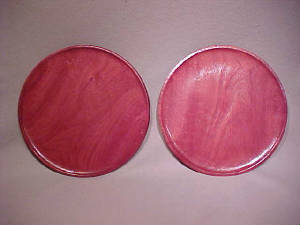 These platters are 12" in diameter. 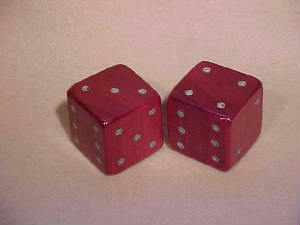 Purple Heat Dice with Turquoise inlay. 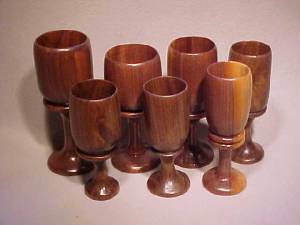 OK, they were not done on a lathe. But I thought they were neat. This was a special order. 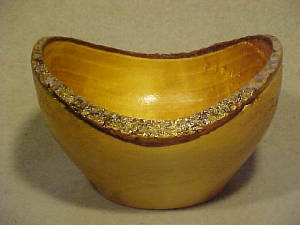 Make two bowls, glue together, add leather and brass. Easy?? 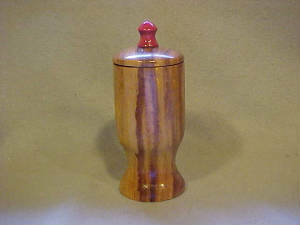 These jars are 12 to 14 inches tall. 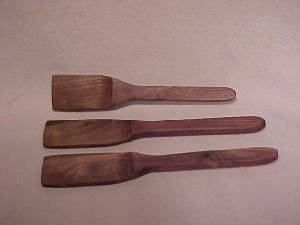 I made them of walnut and maple. 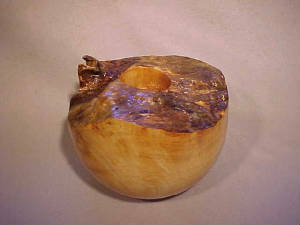 This turning was made from an apple log that had rotted out in the middle. 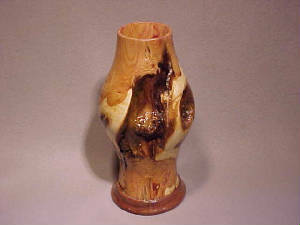 Yes, I like working with this wood when I can get a good piece. About 14" in diameter. 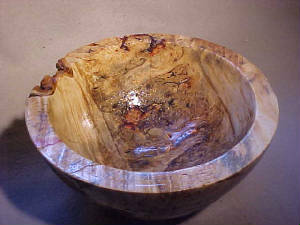 A nice piece made from spalted maple. 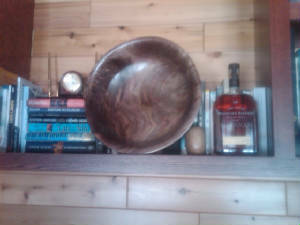 A hollow vessel, isn't pracitical, but looks nice on a shelf. This oak is from a 350 year old tree that came down in a storm. The top supplies contrast. 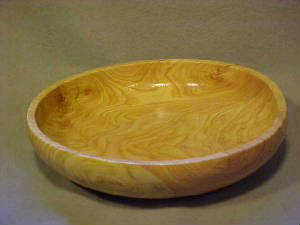 This bowl is 15 inches in diameter. 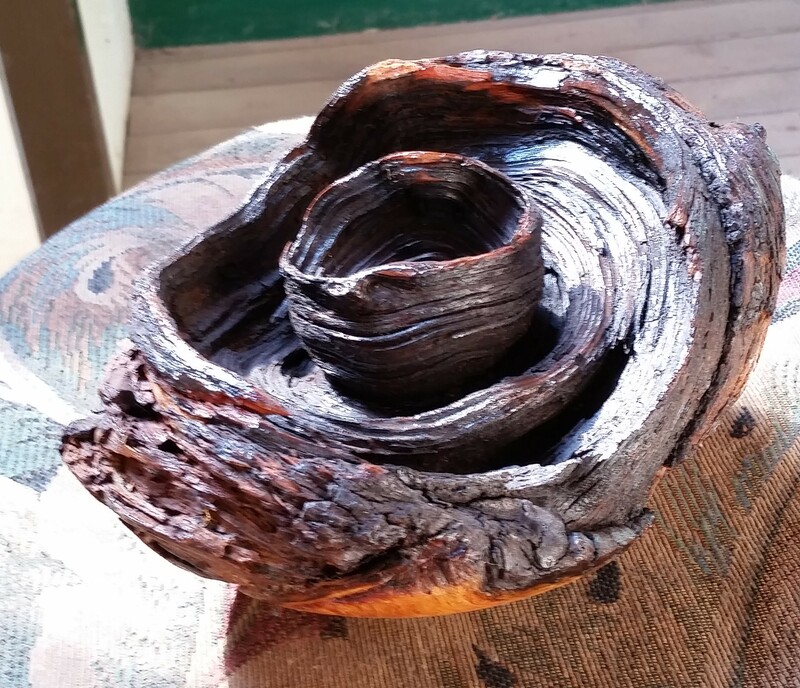 It came from a 250 year old tree. 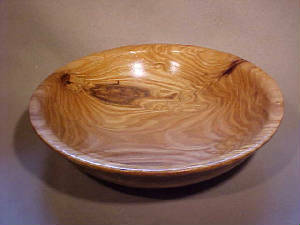 Willow trees with all those curly little branches, can also produce wood with curly figure. The tree was struck by lightning, but lived, this led to cracks and strange colors. 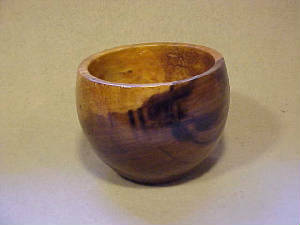 This wood is very sticky and difficult to finish, but looks nice when done. I really like the contrasting colors in the juniper. 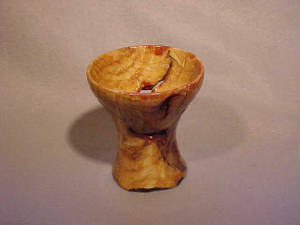 The wood is very sticky to turn, but aromatic. 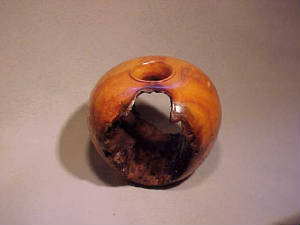 Hollow shape, about 11" in diameter. 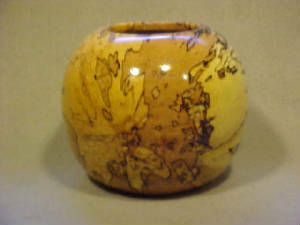 Some more of that nice spalting. About 8" in diameter and about 4" deep. The color is nice and dark from laying on the wet ground. 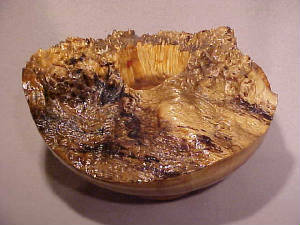 The wood came from a pile of firewood at a the Mayan Ranch in Texas. No one knew what it was. 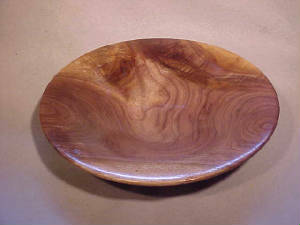 About 8" in diameter, this bowl is from newly cut Walnut. 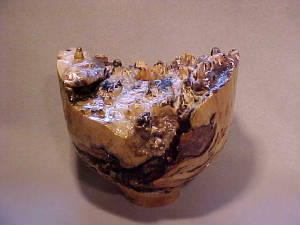 Sap wood is white, the heart wood black. 13 inches tall. 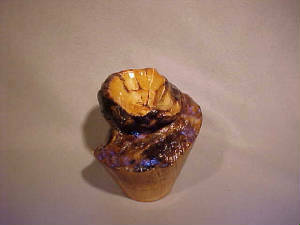 The ambrosia beetle kills the tree and leaves behind the dark stain. Beetle juice? 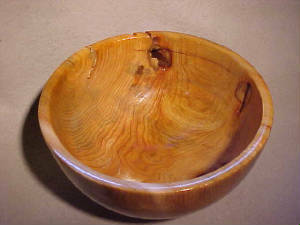 14" in diameter this bowl displays crotch figure(feather grain to Victorians) where 2 branches met. 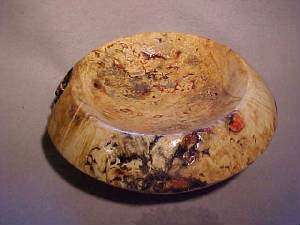 This is another piece of willow burl, but this section didn't develope any spikes. 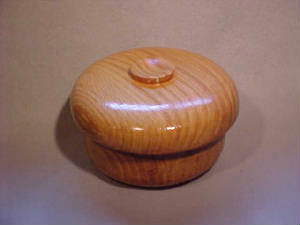 This container is made of cherry, the lid is white ash, the knob is purple heart. I had a pine log, rather soft, but it worked OK. Needed a lot of sanding to get a smooth finish. I thought this looked like a brain on a pot. So this is called "Your brain on pot" or just "Brain". The other side of "Brain"
Once again, I thought a second picture would give you a better idea of what this piece is like. 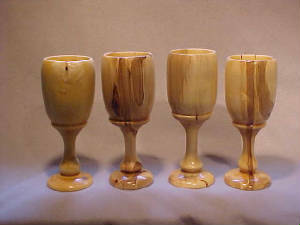 These goblets are 9 to 9 1/2 inches tall. 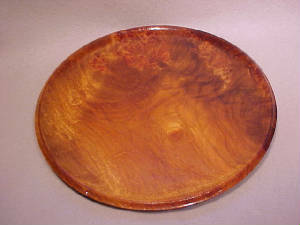 Great for feasting with the "Royals" or the in-laws. This was a custom order. 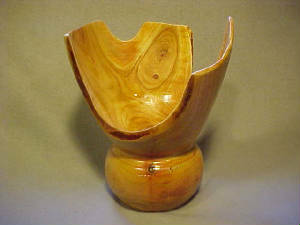 About 14" tall, this was turned from one solid piece of Honey Locust. 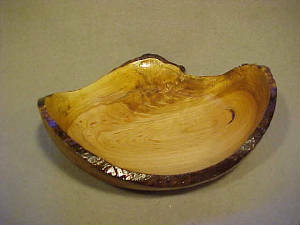 My mother-in-law liked this one and since it came from a piece of her tree, I gave it to her for Christmas. 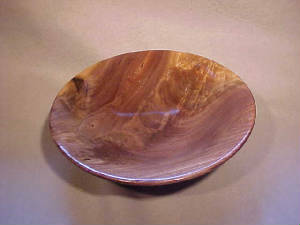 Walnut has a classic beauty all its own. A friends father found this in the woods. I turned the outside smooth and left the interna rings. 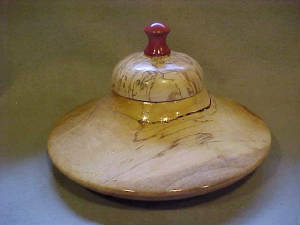 Another interesting piece turned upside down from a regular bowl to create an oval appearance. 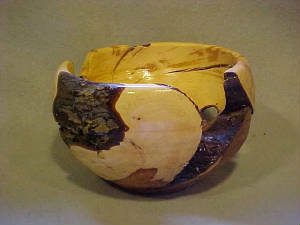 Nice piece made from a juniper root. 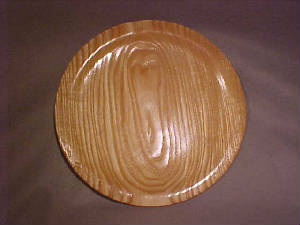 It is sitting on a birdseye maple platter. 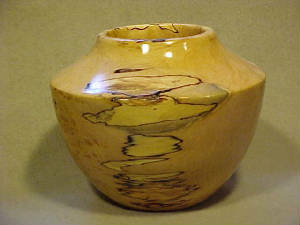 Same log, different design. 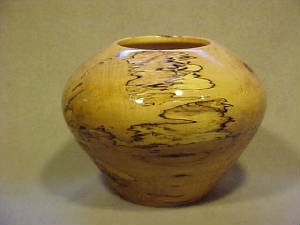 Spalting adds unique character. 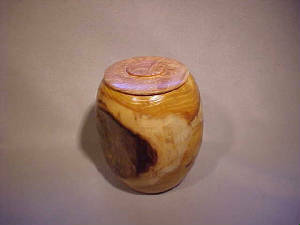 Fourth turning, I hope I find another log like this next year. I put some of my items on display in the office so people will know what I am talking about. This is the other half of the crotch figure that made the bowl above. 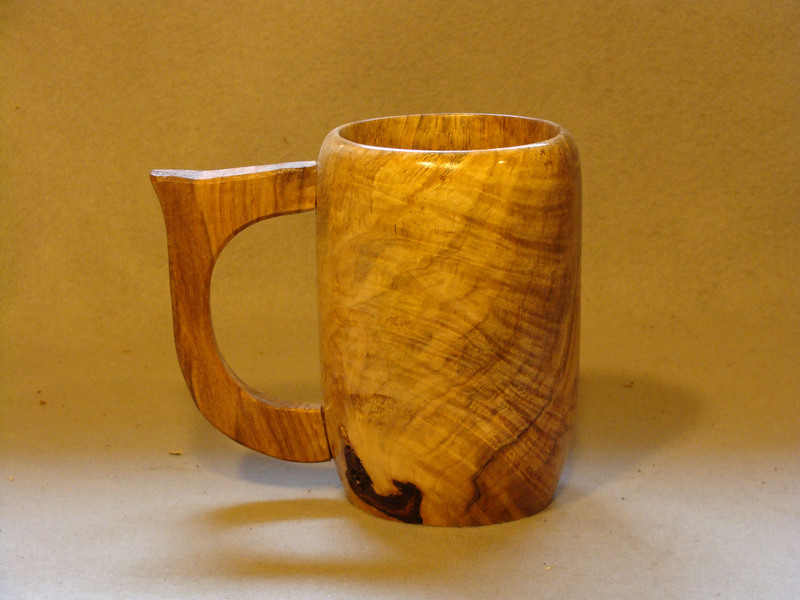 People asked for these so I used some hard maple and copied a style from some old pictures. 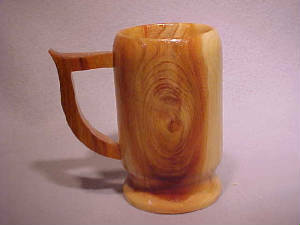 This is not as aromatic as red cedar and is very light in weight. 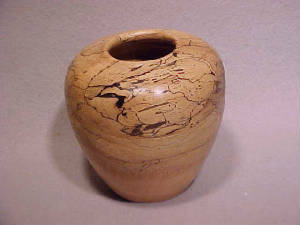 This is from an extremely old tree with lots of spalting and tension or fiddleback grain. 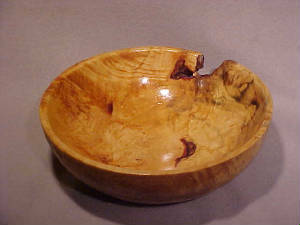 Another piece of that beautiful old maple. 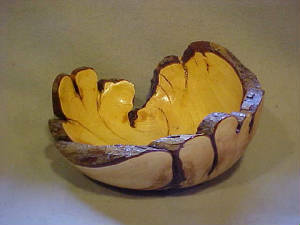 Age and weathering add character to wood and to people. 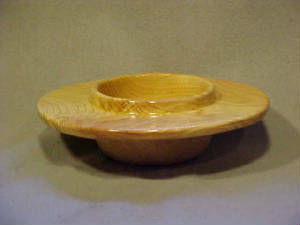 This is a nice piece of white oak, about 14 inches in diameter. 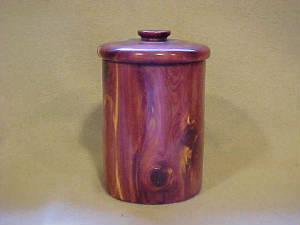 A red cedar cannister, about 10 inches tall. Not for food, maybe cigars for the cedar smell. 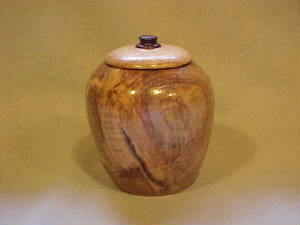 A classic urn shape, made from some very old Maple. 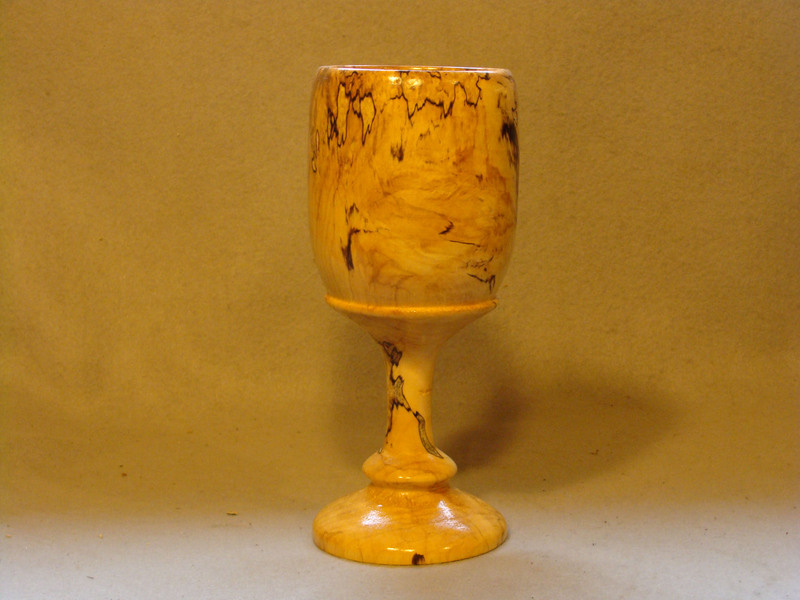 The striped wood is called Tigrillo. 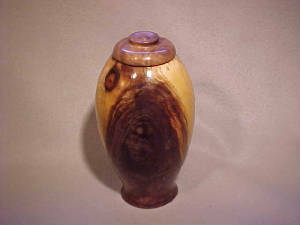 This footed urn is about 8 inches tall. 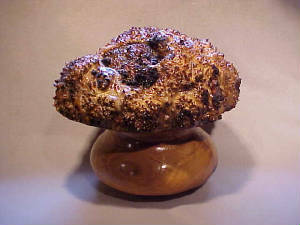 This is from the same tree as the burl on the left. The thorn tree in our back yard died. The trunk was very convoluted and this was the result. 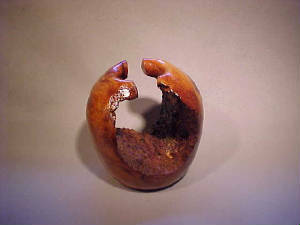 Another piece of my thorn tree; cracks, bark, gouges, just plain ugly, but that's why I like it. 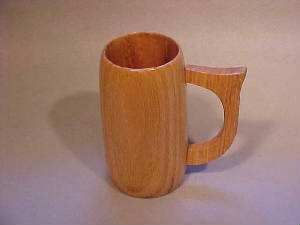 What happens to a mug that splits in half. It might become 2 scoops. This turning didn't split after turning. I like what nature can create. 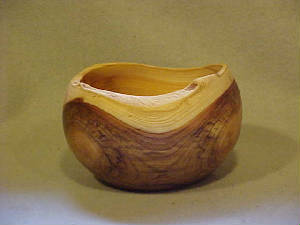 This bowl was turned with the curve of the tree. Quite a difference. 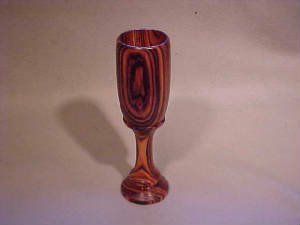 Another beautiful relative of rosewood. I had enough to make a pair of these. 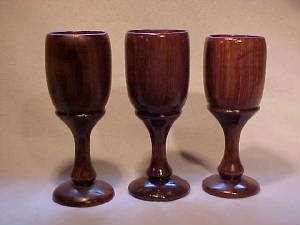 There's a lot more chance for variety in making goblets. These range from 6" to 8" tall. 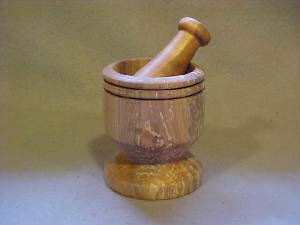 Turning this is great for clearing the sinuses and freshening up the workshop. For this one I didn't turn a raised lip, but rolled the opening into the center. 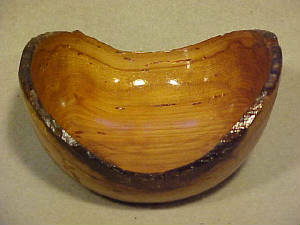 A very pretty wood from America. 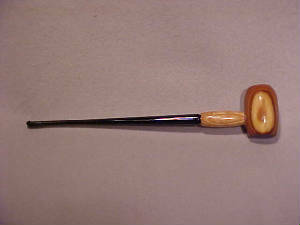 It was once used by the Osage Indians to make bows. 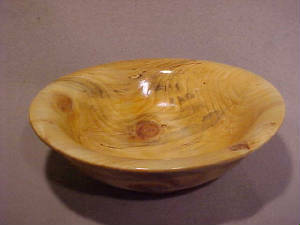 Another bowl from that one beautiful log. 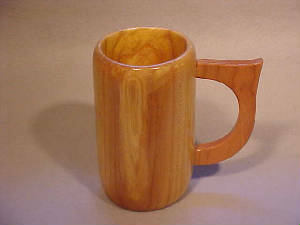 A nice standard sized mug (14-16 oz.). A small branch added character. 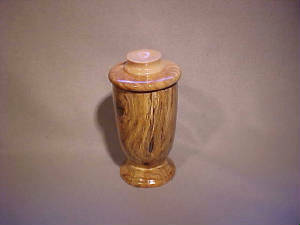 Heart wood and sap wood give the urn alternating colors, complete with a knot. 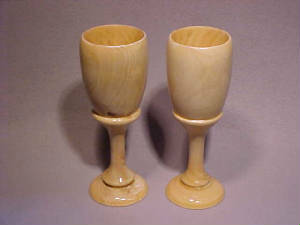 These were turned as a pair for a wedding. They are close to being the same. 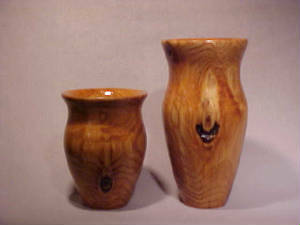 They are 8 1/2" tall. 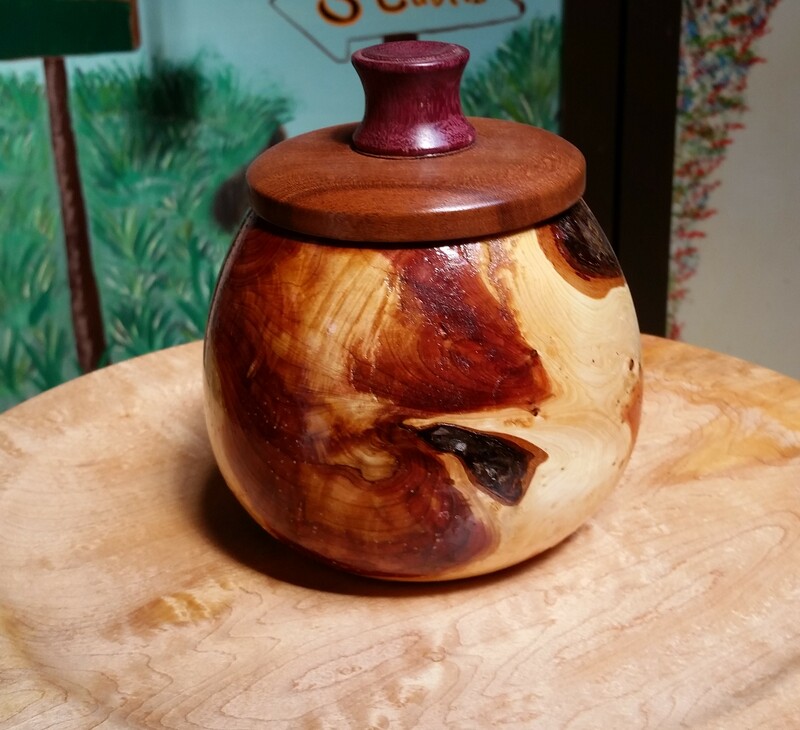 Call it an urn or call it a cookie jar. It depends on what you put in it. This is a new item made of Cocabolo. 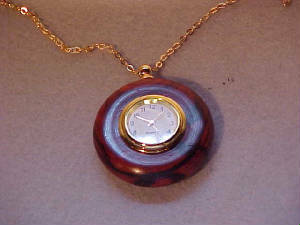 The "clock" is 1 inch in diameter, total necklace about 1 1/2. Oak usually has little figure. I leave bark attached or use knots for visual interest. Not much grain, but good and sturdy. This has been my personal mug for the last 3 years. 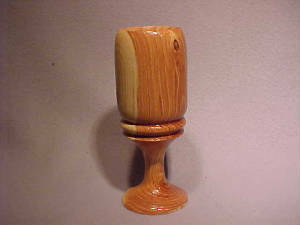 I put this with some oak, because the grain is similar. 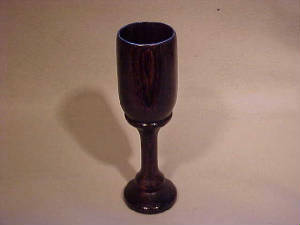 The color is black, almost like fumed oak. 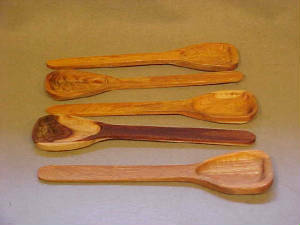 This is a great use for small pieces of wood and lots of fun for the kid in all of us. 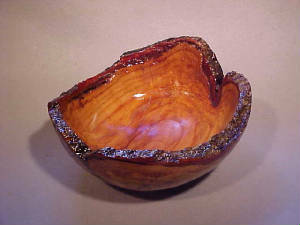 Another piece from this great looking wood. 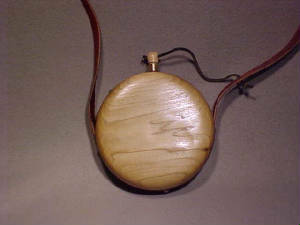 It is about 12" in diameter. 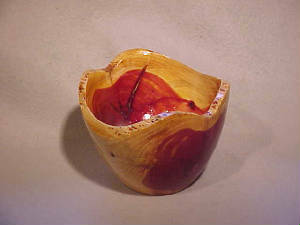 Red fungus stains and natural gaps in the wood, give this non-functional piece character. About 14" in diameter and 1" deep this one was cut before the Emerald Ash Borer attacked. 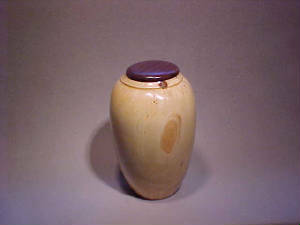 This is a large urn or covered jar. 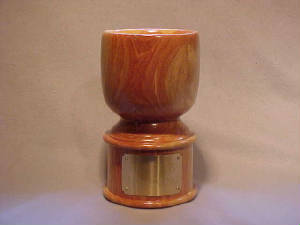 It is about 15 inches tall. This was all turned from 1 piece. Chip and dip, anyone? I like this shape. 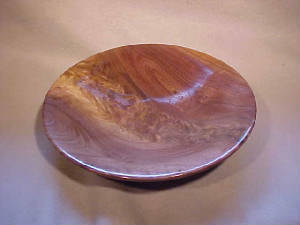 It is basically a bowl within a platter made from one half of a cherry crotch. This is the other half of the same log. Both are about 11 inches in diameter. 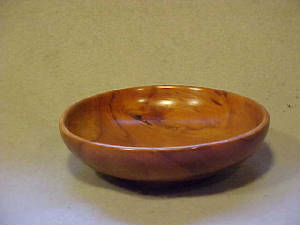 This one is made from Juniper and includes a lot of bark and natural depressions. 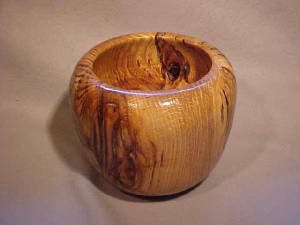 The log was big enough to make 2 of these turnings. This angle shows the rotted out log better. 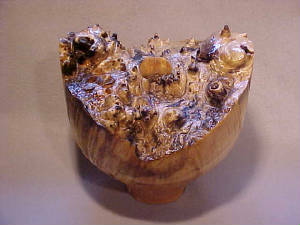 The rough edge is bark, this is turned upside down from a typical bowl that would follow the grain. 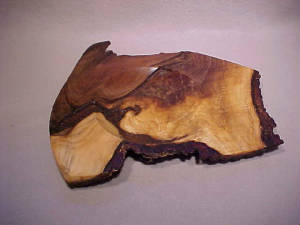 This piece of wood came from Canada and went back to the person who supplied the tree. This walnut grew on my mother-in-law's property. I do visit the in-laws, when motivated. 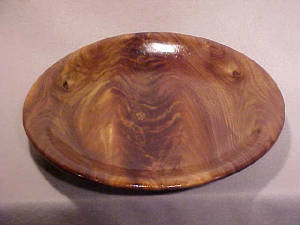 This is some more in-law walnut. I knew there was a reason I got married. 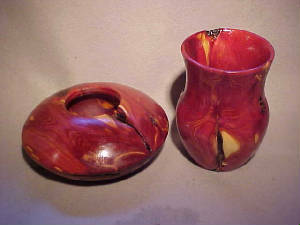 These vases are about 14 inches tall. Red Cedar has more character than I expected. 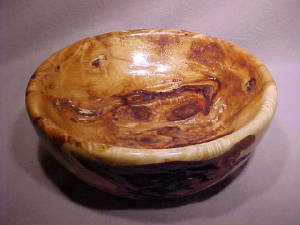 About 11 inches in diameter this one has some nice spalting that adds character. 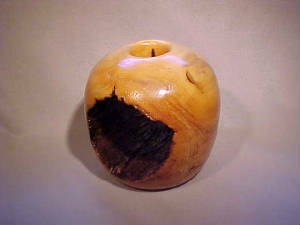 The spalted cherry was left neglected on the wood pile for 3 years of rain and squirrel droppings. 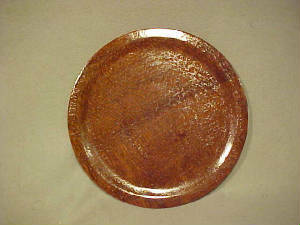 Nice classic shape and about 10" in diameter. 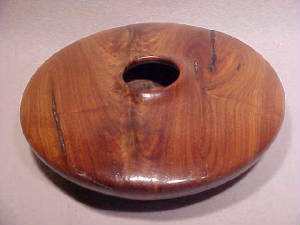 A great looking piece of wood. Just some nice little 7" bowls. 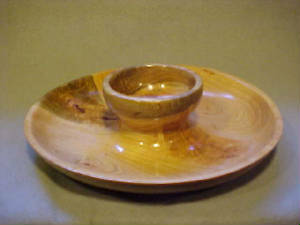 I like wood with contrasting colors. 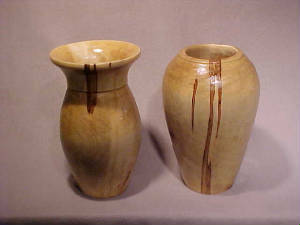 The large vase is 15" tall, the short one is about 8". 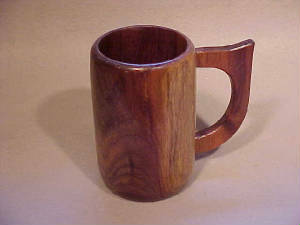 Given to the person who brought the wood. 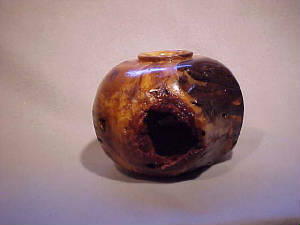 This one looked strange enough, my wife, the Buffy fan, named it "Hellmouth". 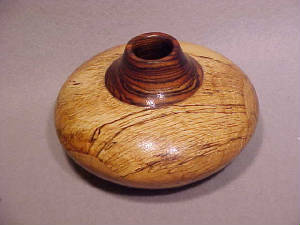 Another non-functional art object. Nice contrast between smoothly finished and rough surfaces. 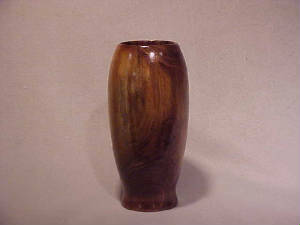 This vase is about 14" tall. The tree came down compliments of the road commission. 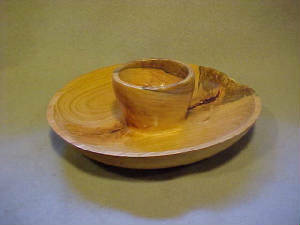 I have only made this one, but I am putting aside odd pieces of wood for this Spring. 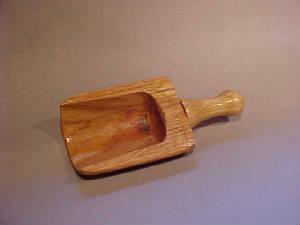 Talk about practical, you can stir your stew with style. Just call this one "Hellmouth 2". I did a miniature called "Heckmouth". No picture of that one. 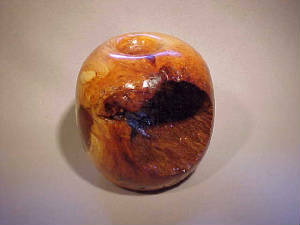 Weird wood looks different depending on how you display it. So, I shot a picture of the other side. 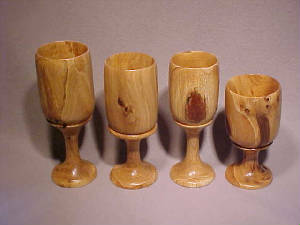 These are 8 to 8 1/2 inches tall. Some show the dark streaking caused by the Ambrosia beetle. 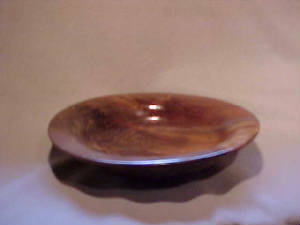 A nice shallow bowl about 14 inches in diameter. Just a very pleasing piece to look at. 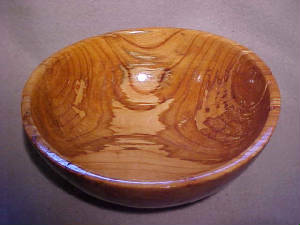 Fungus and mold did a nice job of make a plain wood pretty. This was a little punky but still turnable. The damage gives it more visual interest.